Effective July 24, 2015, Pacific Gas and Electric Company’s (PG&E) employee benefits are administered by Mercer, a leading benefits administration provider that will help us streamline the process for enrolling and managing our employee benefits. With this change, employees are directed to the new Mercer BenefitsCentral to make updates to their benefits—including adding or removing dependents and updating benefit plans. Read the frequently asked questions below for more information and answers to common questions regarding the benefits administration transition. As of July 24, 2015, employees and retirees can use our new personalized benefits website, Mercer BenefitsCentral (accessible via single sign-on from PG&E@Work For Me or from mypgebenefits.com for those outside the network), and Benefits Service Center at 1-866-271-8144 from 7:30 a.m. to 5 p.m. Pacific time. Why did PG&E make this change? We made this change to make it easy for employees and retirees to access and manage their PG&E benefits. The transition to Mercer will give participants access to enhanced benefits technology, tools and resources. Did the benefits change as a result of the transition to a new administrator? No. Only the benefits administration—who processes and manages your medical, dental, vision and life insurance benefits—has been updated. There is no change to the Health Account Plan (HAP), to your selected benefit plan (Anthem or Kaiser) or to the cost of your health benefits. However, due to increased administrative efficiencies, we were able to negotiate a slightly lower supplemental life insurance premium for employees, so you will notice that the cost for your same life insurance coverage is lower. For more information about your life insurance or other benefits, log in to Mercer BenefitsCentral or contact the PG&E Benefits Service Center at 1-866-271-8144 from 7:30 a.m. to 5 p.m. Pacific time. Do retirement plan benefits have a new administrator too? No. PG&E’s retirement plan administration will not be affected by this change. Only health and welfare benefits administration for both employees and retirees will change. Do I need to do anything as a result of this change? Unless you need to make an update to your benefits, there is no action for you to take at this time. You will only need to access Mercer BenefitsCentral during Open Enrollment or to make updates, such as following a life event (marriage, divorce, birth of a child, etc. ), changing your life insurance or updating beneficiary information. However, consider visiting Mercer BenefitsCentral prior to Open Enrollment to familiarize yourself with its many features and resources. How do I contact the new PG&E Benefits Service Center? Employees and retirees will be able to contact the PG&E Benefits Service Center by calling the toll-free number at 1-866-271-8144. Hours of operation will be 7:30 a.m. through 5 p.m. Pacific time, Monday–Friday. To allow for an easy conversion, we transferred the Provant phone number—a phone number you were accustomed to calling for questions about your benefits—to the new PG&E Benefits Service Call Center. We integrated all of the call center phone numbers into one location and added a phone tree IVR to the line so calls can be directed to the appropriate call center based on your needs. Now employees and retirees have one convenient toll-free number for all benefits questions, including questions about medical bills, coverage and claims or to schedule a health screening or talk to a health coach. Where is the PG&E Benefits Service Center representatives located? Mercer representatives servicing PG&E are based in Norwood, Massachusetts. Are PG&E Benefits Service Center representatives knowledgeable about PG&E’s benefits? Yes. Mercer is a leading provider of benefits administration services. Additionally, representatives have thorough knowledge of PG&E’s benefit programs and culture and are able to assist participants with their specific needs. They will be able to answer questions about plan and coverage details, medical bills, claims, spending accounts and related matters. I forgot my username or password to Mercer BenefitsCentral. How do I obtain my password? If you already have a username and password for Mercer BenefitsCentral, you can reset your username or password by clicking on "Get Started" on mypgebenefits.com select Forgot Username or Password on the Mercer BenefitsCentral login page > enter four data elements onto the secure site (i.e., last four of your social security number, last name, date of birth and postal code) along with the verification security code displayed on the screen > answer the challenge questions that you previously provided the answers for to update your username or password. Can you help me understand where to go for information? Mercer BenefitsCentral–a personalized benefits portal that allows you to easily make updates to your benefits. PG&E Benefits Service Center – dedicated phone support to help you with questions or making updates to your benefit plans. mypgebenefits.com – a comprehensive view of all of the benefits you receive as a PG&E employee that support your physical, emotional and financial health. PG&E Pension Call Center – dedicated phone support to help you with your pension and retirement questions. HR Service Center – dedicated phone support to help you with questions about your job title, classification or changing your name or contact information. In addition, the HR Service Center will continue to help with the performance management tool, OCRs and PCRs. My pay statement has a new benefits line item. 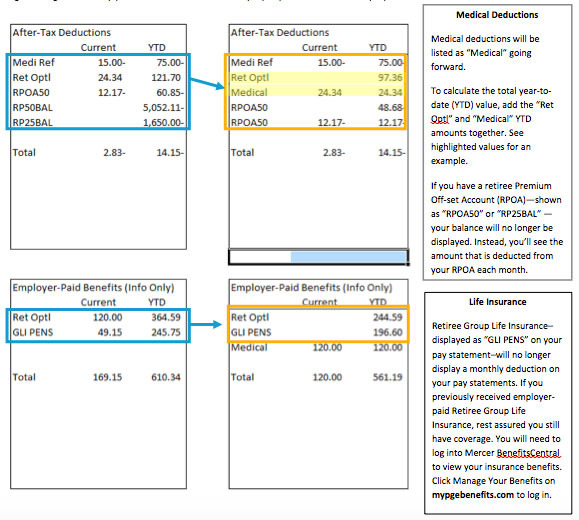 Did my benefits plan (or cost) change? As a result of the change in the benefits administration – who processes and manages your medical, dental, vision and life insurance benefits—you’ll see a new benefits line item on your pay statement. There is no change to your medical plan through Anthem or Kaiser, your dental or vision coverage or the cost of these plans. There is also no change to your Health Account through YSA or Kaiser and your life insurance coverage. Your PG&E medical plan, costs and coverage did not change; however, your pay statement will look a little different. Your medical deductions will be listed as "Medical" going forward. If you have a retiree Premium Off-set Account (RPOA)—referred to as "RP50BAL" and/or "RP25BAL" on your pay statement—your balance will no longer be displayed. Instead, you’ll see the amount that is deducted from your RPOA each month. 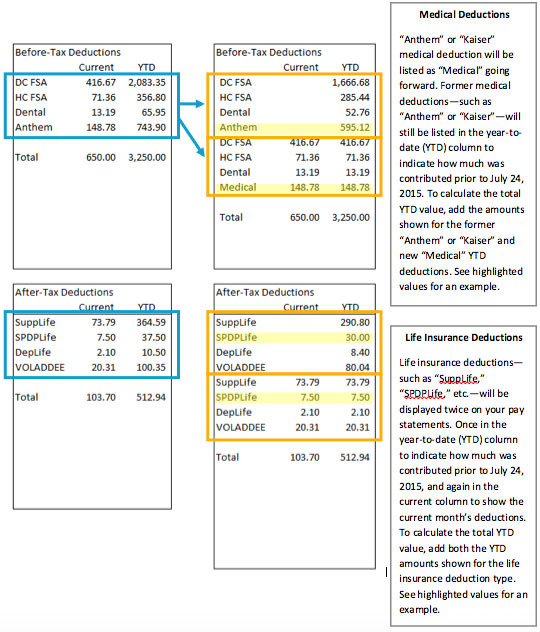 You’ll also see a slight change in the way your retiree life insurance employer-paid benefits are displayed. Why is my insurance premium lower than it was before? Was my insurance coverage changed? No, your insurance coverage is still the same. We were able to negotiate a slightly lower life insurance premium, so you will notice that the cost for your same supplemental life insurance coverage is lower. For more information about your life insurance or other benefits, log in to Mercer BenefitsCentral or contact the PG&E Benefits Service Center weekdays at 1-866-271-8144 from 7:30 a.m. to 5 p.m. Pacific time. Who do I contact if I have questions about my paystub? You may contact our Payroll Service Center at PayrollQuestions@pge.com or 1-415-973-3767. I’m locked out of Mercer BenefitsCentral. How do I unlock my account? If you already have a username and password for Mercer BenefitsCentral, but have entered the incorrect password more than three times, you will need to call the PG&E Benefits Service Center at 1-866-271-8144 to unlock your account. Representatives are available weekdays from 7:30 a.m. to 5 p.m. Pacific time to assist you. Can employees and retirees enroll in and make changes to their benefits online? Yes. Employees and retirees can enroll in benefits through our new personalized benefits website, Mercer BenefitsCentral (accessible via PG&E@Work For Me or mypgebenefits.com for those outside the network). The website has a variety of tools and educational resources to help you understand your benefit options and choose the ones that are right for you. In addition, you can visit the website anytime to manage your benefits throughout the year, such as following a life event such as getting married or having a child, to update beneficiary information or when preparing to retire. The website is available through computers, smartphones, and tablets. How is Mercer BenefitsCentral accessed? Employees can access Mercer BenefitsCentral via single sign-on from PG&E@Work For Me. On the intranet homepage, under Tools, click PG&E@Work For Me > About Me > My Benefits > Mercer BenefitsCentral. To access Mercer BenefitsCentral while at home or not logged in to the network, employees and retirees can visit mypgebenefits.com and click the link for Mercer BenefitsCentral. They will then need to set up a username and password. What is the difference between Mercer BenefitsCentral and mypgebenefits.com? The two sites complement each other. mypgebenefits.com will continue to be accessible to anyone online, so employees, retirees, family members and prospective candidates can use it to access detailed information about PG&E’s benefit programs. In addition, mypgebenefits.com was updated to include company policies like time off, leaves of absence, workers’ compensation and other key information. It is still the easiest and best place to find comprehensive information about PG&E’s benefits programs and resources. To access personalized benefits information, employees and retirees will go to Mercer BenefitsCentral. They will use the new website to enroll in and manage their benefits on an ongoing basis, for example, when updating benefits due to a life event such as getting married or having a baby or updating beneficiary information. Will Mercer BenefitsCentral have mobile capabilities? Yes. The website's mobile-first design ensures consistent inquiry and transactional capabilities across desktop, tablet and mobile devices. You can access the site on-the-go in order to conveniently manage your benefits. This will be an especially helpful enhancement for our field employees. Will this year's Open Enrollment be conducted through the Mercer BenefitsCentral website and new Benefits Service Center? Yes. Employees and retirees will use Mercer BenefitsCentral or the new PG&E Benefits Service Center’s toll-free number to enroll in their benefits during this year’s Open Enrollment. Note that for retirees, the timing for Open Enrollment will be changing. In the past, retirees have enrolled in mid-October. Starting this year, retirees will enroll during the first two weeks of November, at the same time as active employees.